Robbie Stamp's obsession with recorded sound came early when he discovered his parents' tape deck and microphone. Innumerable 'radio programmes' followed, stitched together from silly noises, playing vinyl back at the wrong speeds and reporting on the general goings-on in his household. While playing in bands, Robbie became increasingly dissatisfied with the poor results achieved in recording studios and bought an 8-track reel-to-reel, a couple of mics and an 8-channel mixer. Soon he was engineering and producing bands, making sample collections (as Cyclick Samples) and doing sound design work for theatre companies. He's now about to create a new studio space (Sandpit III) in Bristol and continues to engineer, produce, sound design and write and record with his band, THiNK. Why did you want to be a sound designer? "It was never a conscious decision to get into sound designing, or any aspect of recording or producing audio. What I do know is why I continue to follow this path - the seemingly never-ending learning curve and the joy of hearing something you have created." How did you get into it, then? "It was essentially by accident! A theatre company my wife had started needed some sound - foley, voiceovers, incidental music - for its first show, and I could be obtained for a very small fee: a couple of pints and a nice dinner. 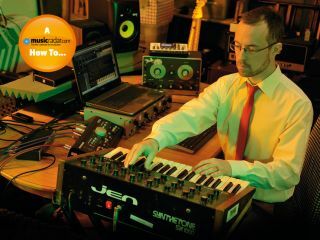 "I was just moving over from tape to a DAW - an early version of Cubase - and was keen to develop my skills at editing without a scalpel. The connections from that job then allowed me to get more work and thus build a profile of sorts." "I have no formal qualifications that relate to my work - I didn't even do grades on piano - but the informal ones are in my opinion the most important. "I have studied many aspects of sound along the way, eating up books on acoustics, psychoacoustics and audio electronics. These have really helped to open my ears and made me realise how the mechanics of sound and sound recording can be used and abused." What are the best and worst bits about your chosen career? "The worst part is that the work is ostensibly freelance, so the constant uncertainty about where the next pay cheque is coming from can be stressful. "Initially, things like the sense of disappointment that comes with negative criticism, or when a job takes too long in proportion to the financial return, can be crushing, but with time you learn to deal with them. "You learn to appreciate criticism when it is useful and ignore it when it isn't. Becoming more able to manage your time and other people's expectations also relieves a lot of stress. Overall, the good bits far outweigh the negatives." What are the essential personal and professional skills for a good sound designer? "For your own sanity, a good skill to develop is timekeeping - never work too long on any one thing, and be sure to take breaks and have a life outside of the audio world. "The other main skills involve constantly listening to anything and everything around you and if possible studying other people's reactions to these sounds - sound is highly emotive and highly subjective. "It's important to be open to the fact that you are always learning and will never truly 'plateau' with regard to your abilities, as there is always room for improvement. "You also need to be business-minded - it's a common mistake to think that this isn't necessary for creative types, but it is if you want to get paid." How has technology enhanced your job? "Technology is indeed a double-edged sword and increased choice can often lead to indecision, but with experience comes an ability to discern a useful advance from one that will only reduce productivity. "The massive growth in online resources has had a mainly positive effect, from freeware plug-ins to sharing information on other people's working practices. The exponential increase in computing power and data storage has only increased the potential for high-quality results from the most modest of setups, though I still rely heavily on analogue sources and processes for many aspects of sound production. "There is no reason why technology should reduce quality or productivity - it's still the end user that dictates the final outcome of any piece of work." "As with all businesses, customers always want more for less, and this will never cease. One must always weigh up the worth of any job on a case-by-case basis. Some jobs will lead to more work and so one can be less finicky about the pay initially, though you must be firm about it when negotiating further deals. Again, with experience one becomes more able to spot a good deal from a bad one. "On the whole, the pay has been good for me - not phenomenal by any means, but on balance I feel well rewarded for my efforts. I calculate everything based on a daily rate that I reassess every year. That way I know I am being paid enough, and if it prices me out of a job, then so be it - underselling never feels good. Occasionally someone offers a total budget for a piece of work that exceeds my normal rate, at which point I say yes and keep quiet!" Do you have any tips to offer to aspiring sound designers? "The pit that nearly all of us fall into, especially when there is so much opinion out there, is to believe that any one piece of equipment or software is essential to create 'good sound', whatever that is. "Upgrading your setup sensibly can really help improve your potential, but never believe the hype about anything. The best bit of gear you own is your head - it's got your brain in it and your ears attached on either side, so learn how best to use them first. "Spending money wisely on your listening environment (monitors and room acoustics) is always the best investment, as it will create the biggest improvement in output quality per pound spent. "Be patient with a mix and be prepared to put it down if you reach a dead end - just make a copy and sleep on it. I find that if I listen to a mix first thing the next morning, the problem areas leap out as my conscious mind is still only just stirring and my instinctual reaction is far closer to that of someone who hasn't heard the work before. "Make notes on your findings and then approach the mix as a list of adjustments - this will place you quickly within the mix before you have a chance to over-consider the technicalities. "Try not to rely on EQ or compression unless they are being used as effects. If the source material isn't up to scratch and needs loads of EQ and compression to make it work then it probably isn't worth the effort." "Two things. Firstly, sound design relies heavily on the subjective nature of sound, the study of which is called psychoacoustics. If you haven't had much contact with this, I would highly recommend studying it to some degree. "There are many books on the subject (one of the best is Acoustics and Psychoacousticsby David M. Howard and James Angus) as well as a wealth of online materials, and whether you just dip a toe or dive right in, it can only help with how you perceive and produce sound. "Secondly, the range of audio tools available today, in even a basic DAW, is staggering, so there really is no excuse not to be out there creating something rewarding. Just check out what the people at the BBC Radiophonic Workshop were doing in the 1960s with a bit of tape splicing, a few microphones and the occasional oscillator, and be inspired - it's truly awesome stuff!" Dream of a career as a sound designer? Get the brand-new Computer Music Special: How To Make It In Music, out now, to find out how to make it a reality.